Pshaw! It’s only a 5K….why get so excited? Some of you can run laps around what I’ve done in my life, as far as exercise goes. In fact, if you could do laps around what I’ve done in my life, you would have to do a few extra just to get your heart rate up. You may think “Why in the world is she making such a big deal out of a piddly 5K?” and I would ask you “Why not? It’s a big freaking deal! !” I mean freaking, as in, I’m still freaking out that I’m actually doing it. This is a person dedicated to the ideals of slothism. Yes, I made that up. I formed a club too, but then I was too lazy to actually see if anyone wanted to join. So it was just me. No, really, I wasn’t lazy. Well, before kids? Maybe. After four kids in five years, I have no idea what lazy is but it sounds delicious! If I dove into the topic of how distracted I can get I’d start a whole new topic in the middle of it (actually, probably five) and then you’d be all confused. I won’t confuse you so I’ll just say that when I start something a lot of things can get me off track and then I forget what I’m doing and….what was I talking about? I don’t want to get distracted and forget I’m doing this jogging thing so I have to commit myself to a goal and that goal is to do a 5 Km run/walk (but I’m jogging, just to be different) in the mountains. Mountains motivate me because I don’t get to see them very often. I love mountains…see? I’m distracted already! With fibro, I have to really keep my expectations realistic. In fact, my own husband and my MOTHER both told me I probably shouldn’t do this thing called jogging because I would probably hurt myself. My own MOTHER!! She doubts….and it hurts (not really, Ma, just pulling your knickers). They both, as if they were reading from the same script, said I should probably do something else…maybe walking. Well, ok, but I walk every day inside and outside and it is so slow and boring. 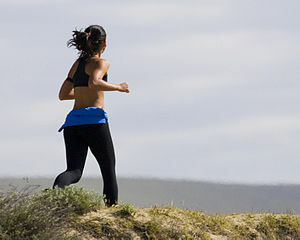 Why not take it up a notch and jog at a walking speed? So, I promised them that I was pretty much jogging/walking and yes, I would stretch before and after and, for PETE’s sake I am only doing 5 km, not a marathon and I will probably come in last with the walkers anyways. I didn’t say that I was totally going to smoke those 5 Km walkers because that would worry them more. I think they internally cheered that I hadn’t committed that $35 registration yet…but I am sooooo going to do it, next week. Now, I’m telling a secret, because I usually don’t talk about my private convo’s with my man, but my he did say that “We have to live with what happens to you, you know.” That statement pretty much galvanized my determination and I vowed that this would make me better, not wheelchair-bound. If my family has to live with me and with whatever may happen, by cracky, this thing is going to have a turn for the awesome! It hurts, people. It hurts. That’s how miraculous this thing is. The people that know me the best are afraid that I’ll crash and burn training to walk/jog a 5 Km. Maybe they should join me? then it wouldn’t be so CRAZY…so Loco….so “What are you DOING?? ?” Huh? *wink wink* How about it? It’s only a 5 Km, so I think I’ll be ok. I know you love me, but really, turn that skepticism into cheers and we’ll get along just fine! Did I forget to mention I’m running a marathon next year? Well, that would just be mean to lie to you like that.